The Flagship FRDM-K64F has been designed by NXP in collaboration with mbed for prototyping all sorts of devices, especially those requiring optimized size and price points. The board is well sized for connected applications, thanks to its power efficient Kinetis K64F MCU featuring an ARM® Cortex®-M4 core running up to 120MHz and embedding 1024KB Flash, 256KB RAM and lots of peripherals (16-bit ADCs, DAC, Timers) and interfaces (Ethernet, USB Device Crystal-less and Serial). The Kinetis K64 MCU family remains fully software, hardware and development tool compatibility with Kinetis MCU and Freedom board families. It is packaged as a development board including extension headers compatible with Arduino R3 shields and includes a built-in USB Debug and Flash Programmer. Following figure indicates the Kinetis K64F signal connections with the board components (RGB LED, Motion Sensor) and extension connectors (uSD Card, Bluetooth and RF headers). SPI Slave - Please note that on this MCU in SPI Slave mode pins labeled MOSI behave as Slave Output and pins labeled MISO behave as Slave Input. The terms MOSI (Master Out Slave In) and MISO (Master In Slave Out) only apply to Master mode. PWM - Please note that the MCU does not support periods of 100 ms. Please consult the MCU reference manual for supported periods. The FRDM-K64F is fully supported in the mbed platform, so it gets access to the free tools and SDK that provides experienced embedded developers with powerful and productive tools for building proof-of-concepts. The pinout above shows the commonly used interfaces and their locations. Note that all the numbered pins (PT_XX) can also be used as DigitalIn and DigitalOut interfaces. Use the USB lead to connect your mbed to a PC. The status light will come on, indicating it has power. After a few seconds of activity, the PC will recognise the mbed Microcontroller as a standard USB drive. Go to the new USB Drive, and click MBED.HTM to open it in a web browser. If you do not have an mbed account, choose "Signup", and create your mbed Account. Otherwise, log in with your normal username and password. This will give you access to the website, tools, libraries and documentation. 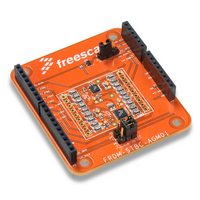 SEEED STUDIO has recently launched a new family called GROVE of compact Connectivity and Sensor modules, much cheaper (starting $2.90) and smaller than Arduino shields.Up to now the Seeed Grove portfolio includes more than 100 extension solutions!! 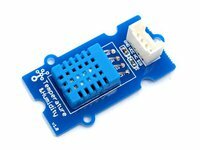 Several Grove adapters are available for the major MCU platforms of the market like Arduino, Rasbperry-Pi... to extend your MCU/MPU board with up to 16 grove analog or digital modules. To connect the Grove modules to the FRDM-K64F, we are going to use the Grove Shield v2 compatible with Arduino board pinout. The mbed repository for the Grove modules covers today 37x Modules with Program Examples and Libraries, which should be easily ported (automatically) for the FRDM-K64F. Collect the Temperature and Humidity measurements and push them to the PC via the Serial interface (instructions available). Collect the Light measurements and push them to the PC via the Serial interface (instructions available). Collect the Collision measurements and push a message to the PC via the Serial interface (instructions available). Collect the Motion detection and push the number of detection since last reset to the PC via the Serial interface (instructions available). Display in the hyperterminal the measurements of the alcohol sensor (instructions available). Control a motor to emit vibrations (instructions available). Control a Relay using the user push-button from the MCU board (instructions available). Display in the Hyperterminal the position of the Joystick (instructions available). Display on a 4-digit screen a clock example (instructions available). MIKROELEKTRONIKA introduced few years ago a new family called CLICK of compact Connectivity and Sensor modules, much cheaper (starting $5) and smaller than Arduino shields. Up to now the Mikroe Click portfolio includes more than 200 extension solutions!! Several Click Shields are available for the major MCU platforms of the market like Arduino, Rasbperry-Pi... to extend your MCU/MPU board with up to 16 grove analog or digital modules. 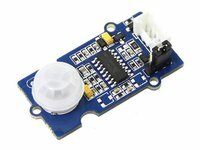 To connect the Click modules to the FRDM-K64F, we are going to use the Mikroe FRDM-K64F Click SHIELD compatible with Arduino board pinout. Control two Relays using the user push-buttons from the MCU board (instructions available). To compile a program for this board using Mbed CLI, use k64f as the target name.